Alise & Syrup | Giving Back ";s:21:"divi_integration_body";s:415:"
Alise lives in High River, AB and she started losing her hearing 20 years ago. As her hearing deteriorated so did her quality of life, “I knew that in order to enjoy my life I needed some help, that’s when I turned to the Lions Foundation of Canada,” recalls Alise. 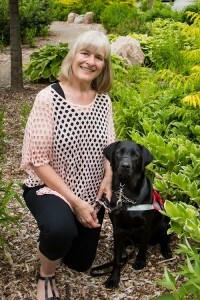 She was matched with her Dog Guide Syrup and together they graduated from the Hearing Ear program.